There were fourteen people squashed inside the back of the gutted airplane. We couldn’t see much out of the windows. The smoke from Eastern Washington’s summer fires had finally rolled over the Cascades. Seated behind me, my tandem instructor said he would normally point out the nearby islands but they were lost in the grey. I nodded, a little disappointed we wouldn’t have a view for what was coming next. “Spotty” asked me why I had decided to jump out of a perfectly good airplane. Good question. “I like heights.” Besides, it seemed a better option than whitewater rafting. “You’ve got to choose something,” I said. Why not skydiving? Spotty had been skydiving ever since his first jump for a hospice’s charity event. “What’s your favorite part?” I asked him. Funny. That was the part my friends and I were most afraid of. If there was any point likely to test our courage, we felt sitting at the open door looking down at miles of open air would be it. Self-preservation tells you to stay seated. Courage is all talk until there’s nothing holding you up. It wasn’t exactly the freefall that scared me though. I knew that part would be amazing. It’s called “the ultimate freedom” for a reason. I knew I would enjoy the flight up and the fall down, but it was the transition between the two that had me worried. Maybe it’s the self-preservation instinct, but I think it’s because I hate change. I wish I had Spotty’s attitude in the rest of life. He didn’t choose either the plane or the freefall but rather the moment in-between. He had already jumped at least nine times that day, but it was still his favorite part of every trip. 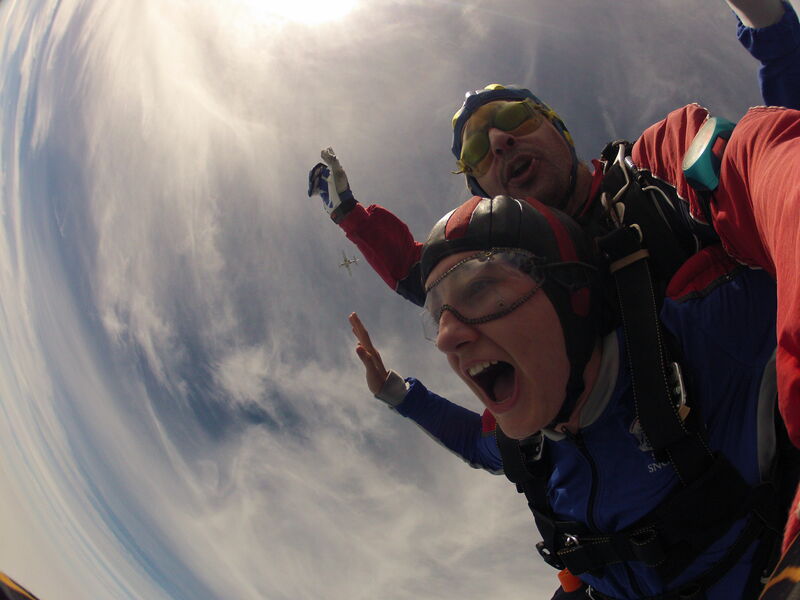 Lately life has felt like skydiving tandem with God, and I still dread the leaps of faith. I know I like where I am, and I know I will like where God calls me to next. Both are great. It’s just the in-between that terrifies me into paralysis. Cross arms. Look up. Say a prayer. When it came to it, I didn’t actually jump. And no one asked if I was ready. Instead, my instructor told me to put my arms in the “safety position”– crossed over my chest, like a dead person. We dangled our legs out the door. He told me to lean my head back and look up. And he pushed us off. 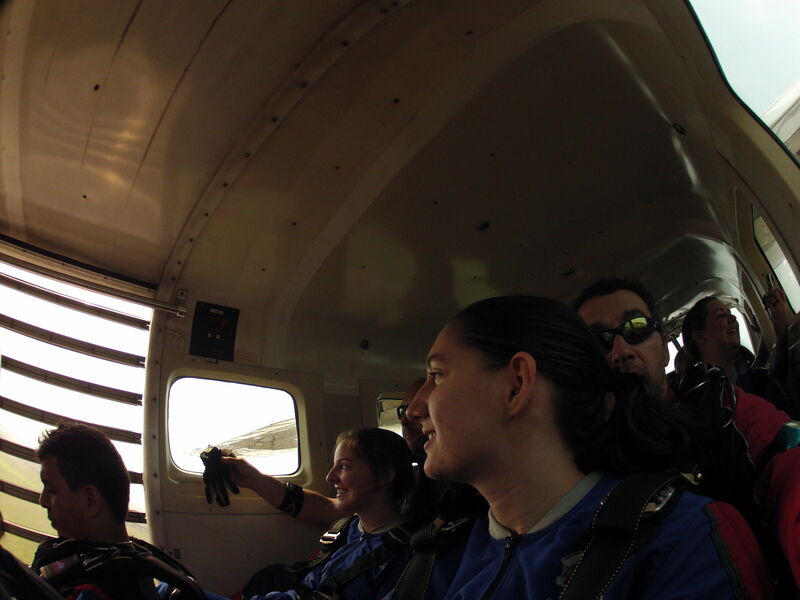 One moment we were seated safely on the plane and the next we were plummeting through free air, 13, 500 feet off the ground. Flying in the airplane–seat-belted in safety–was a fun ride. The tandem instructors were cracking jokes. The new skydivers were nervously laughing. We had a pretty view of the ground through the windows. 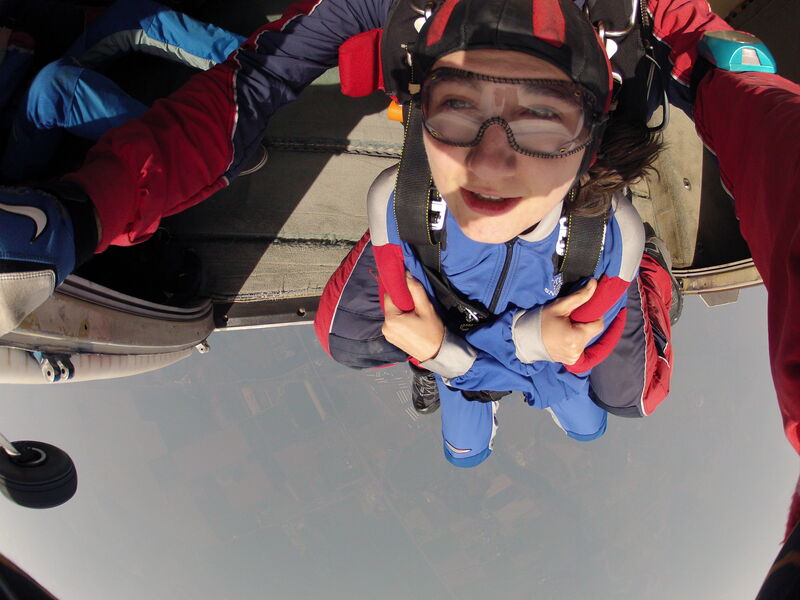 But skydiving…that was exhilarating. So much better than the airplane. In the Christian life, there’s a similar choice of experiences. I could be safe and have a pleasant life without ever taking risks for Christ, but I don’t believe that’s the kind of life God wants for me. The other choice is to go all-in, giving up everything and following Christ whatever the cost on an adventure beyond my imagination. Too often, it’s tempting to settle for less than the exhilarating ride God offers. I pray that he will give me the courage to sit on the edge, the faith to look up, and the trust–when the time is right–to be pushed out. When has God told you to jump in faith? Did you let fear keep you in the airplane, or did you jump gladly, trusting in him? 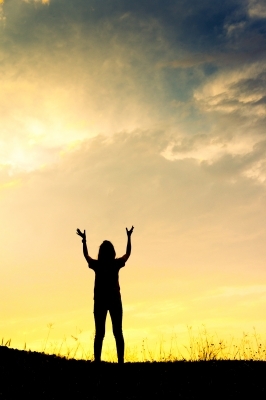 Somewhere along my Christian life, I got into my head that God is all anyone ever needs. But my problem is I still want other things than God. Sometimes it feels like he isn’t enough. And that’s a hard thing to admit. It feels like to do so means I’m denying God. Is it okay with God to want anything besides him? Or does it mean being wrongfully discontent and distracted from true fulfillment? In his book Desire, John Eldredge suggests a different idea. God designed us to desire. God wants us to desire. And God never meant to be our only desire. Think about when life was exactly as God meant it to be. In the beginning of Genesis, God creates and then calls good all that he creates (Gen. 1:31). And you know what? God created man with the need for food. God’s creation was perfectly good just as he made it, but Adam still needed to eat, and God’s spirit alone wasn’t going to fill Adam’s stomach. God instead gave his image-bearer external sources for sustenance (Gen. 1:29). Did you get that? God was the provider, but the provision was outside of God. That wasn’t a result of the Fall; God meant it to be so. You might be surprised that the first time God calls anything not good has nothing to do with sin. In Genesis 2:18, God says, “It is not good for the man to be alone.” Remember, man is still sinless at this point, but something was “not good.” God’s work was not finished. Adam needed a companion. Yes, he walked with God, and God could have “tweaked” his design. So what did God choose? He gave Adam someone else to talk to. Again, that all happened before sin entered the equation. God gives food, but he is not food itself. God provides, but he doesn’t become everything you need. Rather, he wants you to tell him your desires. Imagine that. You can actually go to God and talk with him about your heart. Then together, you can decide which desires are healthy and which are “not good.” God created you with a unique heart for a reason, and he offers you full life by first awakening your heart.